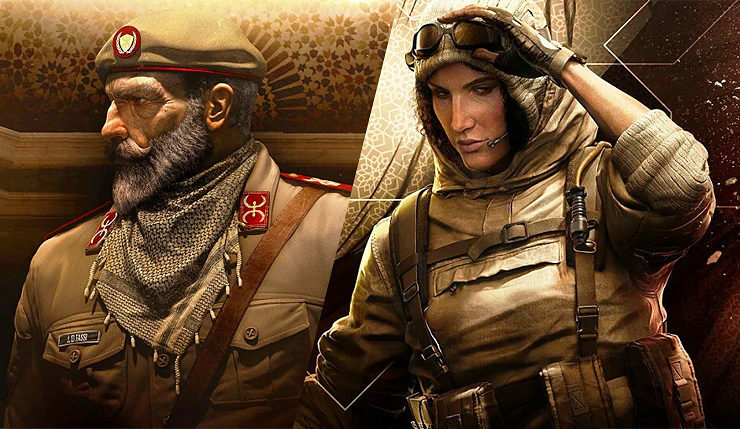 Last week Ubisoft teased Rainbow Six Siege‘s fourth “season” of Year 3, Operation Wind Bastion, and now they’ve released new information and trailers for the update’s two new Operators. First up, let’s get to know the new Defender, Kaid. Early in his career with the Royal Moroccan Gendarmerie, Kaid demonstrated natural leadership skills which later led to his promotion as the 8th Commander at the country’s famed Fortress. Kaid abides by strict values and he leads by example. Over the years, his teaching methods and leadership style have proven to be effective. The Fortress gained accolades and its reputation continues to rise, making Kaid arguably the most successful resident Commander at the famous Kasbah. He teaches all incoming soldiers to be self-reliant. This is a skill that his former graduate and the new Attacker on Rainbow Six has taken to heart. Often labelled a “traditionalist”, Kaid firmly believes that over-reliance on technology can be an Operator’s downfall. He’s curious to see how many of Rainbow’s specialists can adapt on the field without high tech assistance. However, protecting the Fortress is his top priority and his spider-inspired gadget can complement his security systems. Brought up in a wealthy family, Nomad enlisted in the Royal Moroccan Army at a young age and graduated from the renowned Kasbah Sehkra Mania. She later joined the GIGR. Having served multiple tours with the Mountain Infantry Battalion, she’s her unit’s expert on environmental operations. Between tours, she undertakes solo expeditions where she sketches out her trips in her notebook. Both introspective dreamer and practical survivalist, she’s visited more countries on foot than any other Operator in Rainbow Six. Her travels also enabled her to encounter many secluded cultures, which resulted in self-taught skills in cultural diplomacy. The latter may be a soft power but it’s not something Six could overlook. Nomad’s top conditioning and her repertoire of unique skills were more than enough to warrant an invitation. These two seem like a couple solid additions! Ubisoft will be showing off Kaid and Nomad in action on November 18 during the Rainbow Six Siege Pro League Finals. Rainbow Six Siege is available on PC, Xbox One, and PS4.